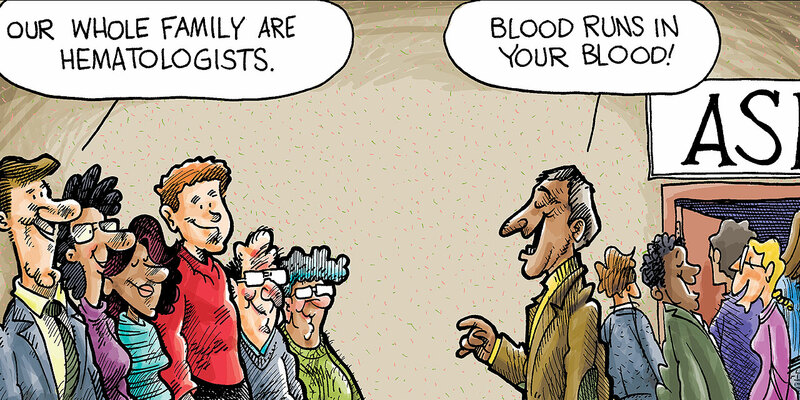 For many, the annual meeting of the American Society of Hematology is like a family reunion. The American Society of Hematology (ASH) annual meeting is more than mentors, researchers, and scientists sharing the latest updates in research — it’s also a family reunion. As a high school student in Shannon McKinney-Freeman’s experimental hematology lab, I remember hearing the buzz of abstract preparation for the annual meeting — I never imagined that as a third-year medical student I would attend the meeting twice to share, learn, and enjoy getting to know the powerful persons leading the breakthrough sessions and oral presentations. Having been able to share a seat at the table, invited by mentors and through trainee awards, I reflect on the amazing opportunities I’ve had through mentorship and how my passion for research began. For three straight summers after my senior year of high school, my mom drove me to St. Jude an hour before she had to be at work and would pick me up as soon as she got off work around 5:30 p.m. Memphis summers were hot and our car didn’t have air conditioning so I’d always pause to enjoy the gust of cold air from the sliding glass doors of the Danny Thomas Research Tower before I’d run to her car. It was truly amazing getting the chance to learn bench science as a senior in high school. We were trying to better understand the maintenance and potentiation of hematopoietic stem cells with future intentions to identify key players to better hematopoietic stem cell transplantation — a concept I talked incessantly about to my mother when she picked me up during those hot Memphis summers. I fondly remember Per Holmfeldt, PhD, the postdoc in the lab, teaching me Swedish phrases while explaining titrations, and McKinney-Freeman drawing out protocols and concepts in our weekly meetings. At the time, I knew both of them valued me in the lab and that the skills I was learning would be helpful to our team. Possibly unknown to her at the time, Dr. Mckinney-Freeman was building my confidence to become a scientist. After undergrad, I knew I wanted to expand on what I learned during my time in experimental hematology, but I yearned for more patient interaction. McKinney-Freeman put me in contact with Jane Hankins, MD, MS, in clinical hematology. I was a bit scared to leave McKinney-Freeman’s guidance, an angst many trainees experience, but from there I have been able to complete two award years through ASH and appreciate the new field of transition to adult care for patients with sickle cell disease. Further, Hankins has instilled an appreciation within me for persons living with a complex and multifaceted blood disorder. Through Dr. Hankins, I’ve developed my critical thinking skills and received guidance from her colleagues all across the country. She has opened her expertise to me as well as her hematology family, and it’s become evident to me that it’s the people behind the science that make the annual meeting so exciting. For the first time, ASH released a Sickle Cell Disease Initiative for 2018 that encouraged and supported the work of many researchers and even legislation in sickle cell research. Further, the Food and Drug Administration (FDA) approved the second drug for sickle cell disease, L-glutamine. Promising new drugs, such as P-selectin inhibitors, namely Crizanlizumab, were a buzz at ASH this year. One of the sessions I was most excited to attend detailed the results of a completed phase II trial headed by Kenneth Ataga, MD, who is now director of the University of Tennessee Health Science Center, Center for Sickle Cell Disease. In a panel of other leading researchers in novel therapeutics for SCD, he detailed Crizanlizumab’s successes in decreasing incidence rates of vaso-occlusive pain episodes. Further, he and the other panelist highlighted a trend in drug development-targeting anti-inflammatory properties rather than increasing fetal hemoglobin expression, which has been a previously favored strategy in SCD drug development. As I walked through the doors at ASH this year, I couldn’t help but think about how the annual meeting has become a reminder to me of the family I have gained. Welcomed by two leading female researchers, I’ve started to discover my own research interests and hope to instill the same confidence in other young trainees. The ASH annual meeting brings together those who have helped me the most in my research journey, and is becoming a family reunion for me as well. Anjelica Saulsberry is a medical student and American Society of Hematology Minority Medical Student Award Program Yearlong Recipient in Clinical Hematology.